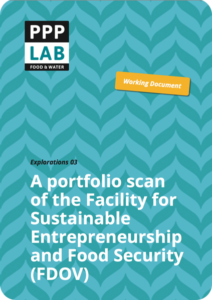 This document presents an initial analysis of the portfolio of projects approved under the first call of the Facility for Sustainable Entrepreneurship and Food Security (FDOV). It seeks to get to grips with the basic ‘change logic’ of these projects from a public–private partnership perspective. The main objective of this study is to investigate the types of PPP dynamics that have been created in the FDOV portfolio, focusing especially on the engagement of private partners. The document defines several groups of projects within the overall portfolio. The change logic of each category is described in terms of the type of lead private partner, the other partners involved, the core focus, the type of projected benefits, and the ongoing business or financial proposition. In addition, specific observations and questions are raised for each category and where relevant further sub-categories are distinguished. The document concludes with some overarching insights and questions about the FDOV portfolio as a whole. It must be stressed that this scan is the result of a desk study conducted on the basis of the proposals alone. The projects have now evolved. The further development of these projects since their approval will be among the issues explored in the Mid-Term Review of the FDOV that is taking place at the moment, in which PPPLab will participate. Your feedback is of great value to the PPPLab! In case you would like to react to these Explorations and share your ideas, please send an e-mail to info@ppplab.org.